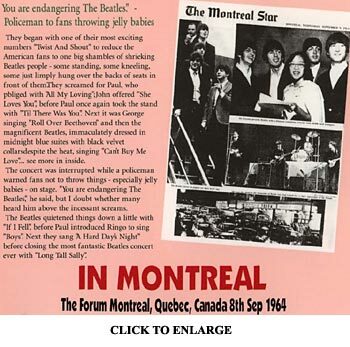 ABOUT THIS PRESS CONFERENCE & INTERVIEW: Following their two concerts at Maple Leaf Gardens in Toronto, Ontario, the Beatles traveled to Montreal, Quebec for two performances at the Forum on September 8th 1964, the 16th city of their 1964 North American Tour. 15-year-old Ted Brennan was among the thousands of teenagers in attendance that day. Ted recalls, "I remember being very excited at the thought that I was in the same building as the Beatles... the unique sensation of being in the same place as my idols, breathing the same air." Brennan remembers having difficulty hearing the Beatles' performance: "The only time the music could be heard was the first few notes of each song, before the screaming sound would drown it out until each song ended. There was constant screaming for the entire concert, only stopping long enough between songs to hear them... mostly Paul as I recall... doing a short intro before the next song. Then bedlam again! I remember vividly a feeling of electricity running up my spine the entire concert! 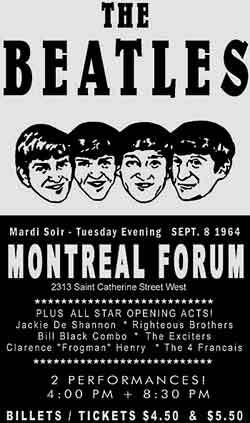 In retrospect, it was more of a sociological experience than a music concert." Q: "Is Paul getting married?" Q: "How about Jane Asher?" PAUL: (jokingly) "I don't know." JOHN: (jokingly) "I'm going out with her." Q: "Paul, is John the boss of the Beatles? Do you agree with that?" PAUL: "I don't know really. On some things he is. I'm trying to think if he is." PAUL: "There's no real leader, anyway. It depends who shouts the loudest." Q: "What do you think of your 'screamies'?" JOHN: "That's what we're here for." Q: "John Lennon said that the Beatles do not set examples. Why not?" JOHN: "Because we're not here to set examples, thats why. We're here to play." Q: "Do you think you ARE setting some examples?" 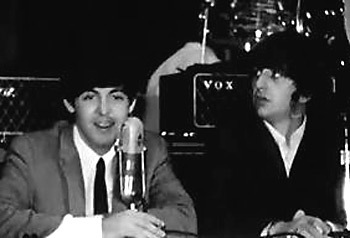 PAUL: "But if we are..."
JOHN: "Only how to make money quickly, which is a good example, I think." PAUL: "...we hope there's no bad ones. There's not many... not so many bad ones, anyway." Q: "We never hear Ringo Talk. Can he talk?" JOHN: "If you address him." RINGO: "If you ask me something, I'll answer it. I'll talk to anybody." JOHN: (laughing to the others) "Even you!" 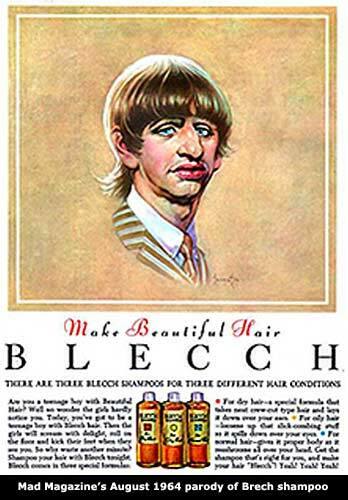 Q: "Did BLECCH hair shampoo get permission from you to put your picture on the back of Mad Magazine?" JOHN: "We didn't know about it." RINGO: "I didn't hear a thing." PAUL: "It was a joke, wasn't it. I don't think they got permission." Q: "Where will you be?" GEORGE: "We don't know. It depends on the hurricane." PAUL: "There's a hurricane in Jacksonville." YOUNG FEMALE: "Are you making a new movie?" PAUL: "Yes, we're making a new movie in February." PAUL: "Umm, I think it MAY be in color, but there's no definite plan." Q: "Because John is married, does he find that fans react in a different way?" JOHN: "I don't. No. I might have less 'cuz I'm married but the ones I have got react the same." Q: "Are you going home to vote? And if so, how will you vote?" PAUL: "We don't know enough about politics to vote anyway." Q: "Do you have any idea about how many records you've sold?" YOUNG FEMALE: "Do you speak french?" JOHN: "No. I took it at school but it didn't do any good, you know." Q: "Are the rumors about Ringo true concerning Ann-Margret?" RINGO: "No, I've never met her. It's a filthy lie!" RINGO: "It is, you know." Q: "How about Joey Heatherton?" PAUL (demandingly) "How about Joey Heatherton?" JOHN: (laughing) "How about Joey Heatherton?" PAUL: (to Ringo) "Who's that?" GEORGE: "Never 'eard of 'er." PAUL: "Who is it? Who's Joey Heatherton?" JOHN "How about Boris Morris?" Q: "What other groups have you written songs for?" PAUL: "Peter and Gordon, and uhh..."
JOHN: "The Fourmost, in England." PAUL: "The Rolling Stones, The Applejacks, Billy J. Kramer, Cila Black, The Fourmost." 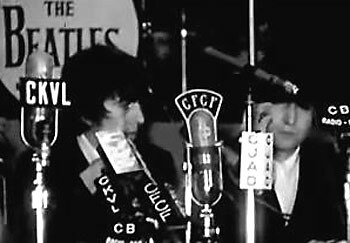 Q: "Would the Beatles like to appear in other cities here in Canada... not only Montreal, Vancouver and Toronto..."
JOHN: "We'll appear anywhere where there's enough people and enough money, you know." Q: "Would it be too personal to ask how much the Beatles have grossed so far?" GEORGE: "We don't know. We ran out of fingers to count on." PAUL: "Umm, we haven't got tans, no. We have tans when we're on holiday, but we lost 'em. I don't miss it. It's too much work trying to get a tan, anyway... and hot, sitting in the sun all day." Q: "What do you do while you're cooped up or imprisoned in the hotel room?" Q: "If you were to change your style, how would you change it?" JOHN: "Well, we couldn't. you know. Well a bit, but not much. It'd still have to be three guitars and drums and that." Q: "Is the tour going according to plan?" JOHN: "Yes, except for the hurricane." Q: "Have Montreal teenagers behaved themselves?" JOHN: "I think they're the most well-behaved, so far." Q: "Does any one of you speak french?" JOHN: (showing off a memorized phrase) "Je me leve a sept heurves!" Q: "Is it true you really enjoy the screaming?" PAUL: "It's good for the atmosphere, you know." 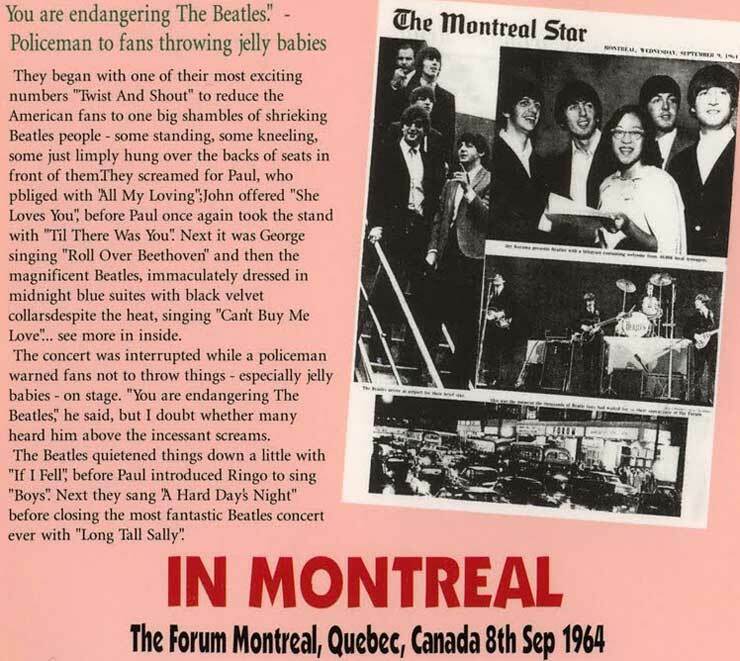 Q: (holding a magazine) "Paul, this magazine reported that you're agnostic. Any comments?" PAUL: "I am, you know..."
Q: "Who does Ringo consider to be the best actor of the group?" JOHN: "And I like Ringo's acting best, too." Q: "What was the background to the recording of 'Aint She Sweet'?" Q: "After you've had a recording session, do you have any extra dubbing that you do... Do you dub any parts on guitars...?" DEREK TAYLOR: (referring to the fans screaming outside) "About three more questions. A lot of pressure, I'm told, on the outside doors." Q: "What is the attendence tonight?" DEREK TAYLOR: "About nine thousand to ten thousand." Q: "Do the Beatles plan to come back here?" JOHN: "We don't plan, but we'd like to." JOHN: (giggling) "There's a lot of money over here." DEREK TAYLOR: "Two more questions." Q: "What group, would you fellas say, might give you a little bit of a problem in the next year or so..."
GEORGE: "Black And White Minstrels." PAUL: "It could be anyone, you know." Q: "Did John Lennon force one of the emcees off-stage in Vancouver because he had asked the children to be quiet?" JOHN: (laughs) "No. I'm not a very forceful type." YOUNG GIRL: "How much of a part has your haircut played in your success?" PAUL: "Quite a bit, you know, nationally. But originally it was our records that brought us to the interest." Q: "Do you prefer to be singers first, or musicians first?" JOHN: "Singers, 'cuz we can't play." JOHN: "Well, I can't, anyway." Q: "John, How did you come to write your book in the first place?" JOHN: "Umm, it was a hobby, and I'd been doing it before I was a Beatle, you know... before I sang or anything." Q: "The book's a collection of pieces you wrote over a period of years, or all at once?" JOHN: "Yeah. Most of it's new but there's about four or five pieces from when I was about seventeen or eighteen." Q: "For North Americans it's difficult to understand the language, which is Liverpool... it's a bit of Hamburg... it's broken language. Now this disrupted language, do you do it on purpose, sort of, with the words.. with the letters? Or is it something you just hear?" JOHN: "Oh no, I mean, you'd never meet anybody that talks like that. I've never met anyone. It's just the way I like to write, you know. It makes me laugh." Q: "Do you think there's anybody else trying to copy you?" JOHN: "I don't... I haven't noticed it. I get a lot of letters from fans doing it in sort of the same style, but it doesn't harm anyone." Q: "You don't copy it from Edward Lear, for example?" JOHN: "No, I've never read Lear, or Joyce for that matter, which is the ones they always mention. I've read Thurber and Carroll, that's all." Q: "Do you have any ideas for anything more to write from your North American impressions, or have there been too great..."
JOHN: "Well, I never use impressions, I only use people anyway... and very seldom that... I just use it out of me head." Q: "Do you have anything else lined up?" 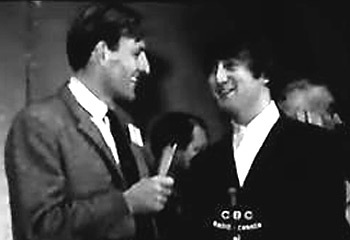 JOHN: (giggling) "Well, I'm just writing another one, almost the same, just different people, you know."